Fall is in the air and you need the perfect set to swing in to get your Pumpkin Spice Latte. 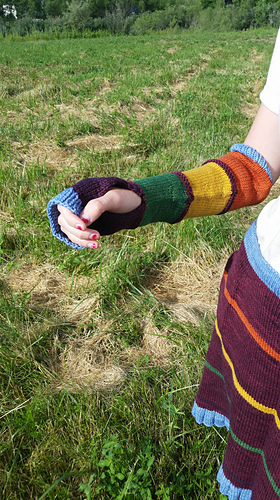 Gloves have always seemed so fussy to me, but fingerless mitts (now you are talking my language!) leave your fingers free to knit, or grasp your favorite cup. Traditional mitts always seem to leave the rest of my arms freezing, though, so this are up to the challenge, providing just a bit of extra warmth that will allow you to continue reaching for your favorite tee just a bit longer. Using a color palette of fall colors from The Fiber Seed, this collection is a wonderful opportunity to play with the colors of Fall and work on your knitting skills. Increase your knitting skills and complete a full fall wardrobe. Tapestry needle, measuring tape, scissors, stitch marker.